Dr Cranky is a fun loving but frank character who wants to get kids on bikes. It's also a group of parent volunteers and schools helping to get more kids riding, recycling bikes and strengthening communities. Dr Cranky's Ltd is the registered Charity that operates the program (ABN 90 625 184 527). The focus of the program is providing bikes to disadvantaged children and families (see the constitution). Recycling and repairing bikes at schools lets us do this in a targeted way without ostracising those in need. All funds raised go towards providing bikes, parts, helmets and locks to those in need. ​It all started with Bart Sbeghen and Peter Hormann at Flemington Primary School. 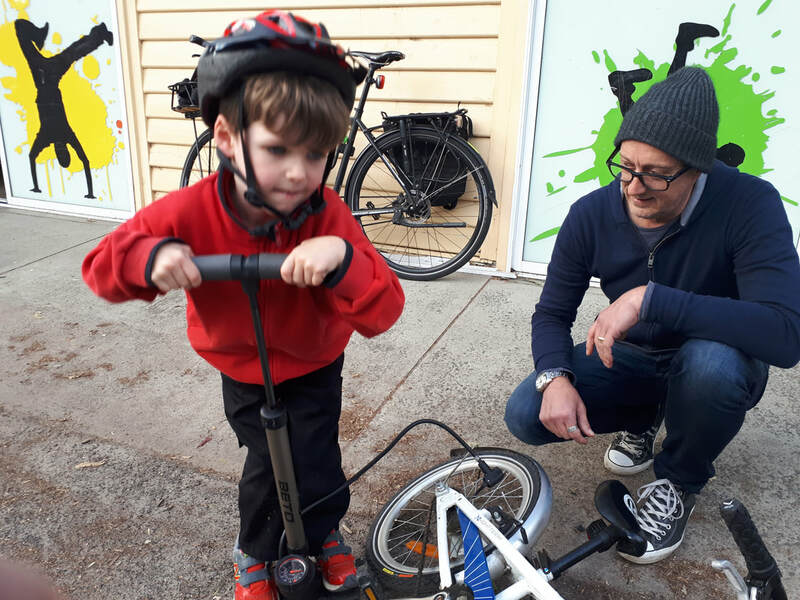 After the unexpected success of the "Bicycle Hospital" at the school, Bart (L, Peter R) left his long term job as a bicycle advocate at Bicycle Network in August 2016 to help establish Dr Cranky Bicycle Hospitals at other schools. Dr Cranky is a character kids and parents can relate to. Dr Cranky's Ltd is also a registered Australian charity with Deductible Gift Recipient status who purpose is to get help disadvantaged kids and families on bikes and riding. ​Dr Cranky started as a concept in Bart's head while talking to friends about the Bicycle Hospital and its origins. Bart saw the potential of a program that brought humour and frankness to a school bike program for kids. Dr Cranky embodies the attitude and name ( and character/mascot) of a program that wants to help school communities get kids riding, recycle bikes and connect people. ​The Bicycle Hospital started as two Dad's repairing bikes under a tree at our kids' school. Four years later Dr Cranky had helped repair and give away over 1000 bikes at ten school Bicycle Hospitals.